Wentworth Sports News: Wentworth Gymnasts win Gold! Fresh from their success at the Auckland Secondary Schools Championships, the Wentworth Senior Rhythmic Gymnastics team competed at the New Zealand Schools Championships at the ASB Stadium on Saturday morning. 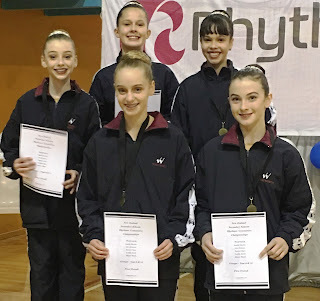 Despite a few pre-competition nerves, the team of Bronte Heath, Sophia Mueller, Emma Gilpin, Alex Dobson and Caitlin Smith rallied to win the New Zealand Year 9/10 Rhythmic Gymnastics Group title. Following on from the success of the Senior team, the Wentworth Junior Rhythmic Gymnastics team of Caitlin Smith, Natalie Brewer, Teresa Sell and Sophia Gardiner will attempt to add to the medal haul at the AIMS Games in Tauranga this week. Wentworth Sailors Win the InterDoms! Best of luck to our InterDom Sailors!